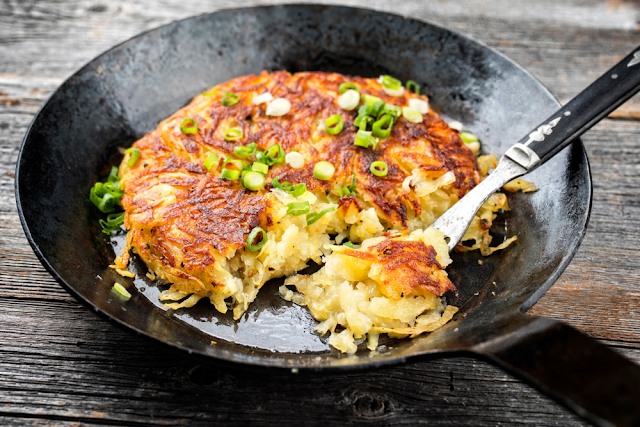 Traditionally Swiss farmer’s food, rösti is one of my favorite ways to serve potatoes. Crispy and rustic, this easy two-step process is a beautiful way of bringing potatoes to the table: First, parboil the potatoes the day before so that they don’t remain crunchy in your rösti—no one likes raw potatoes. Let them refrigerate overnight; the next day, grate them, and then cook them in hot margarine. Flipping this potato dish is actually the easiest part; do not be daunted. Just lay a platter or unrimmed baking sheet on top of the cooking pan, turn it out, and then slide it back in. This delicious potato cake just needs a few sprigs of thyme scattered around the bottom as garnish, and it is sure to become a dinner party or brunch showstopper. If you celebrate Hanukkah, this is the perfect latke alternative. In fact, this is the way that my husband’s grandmother used to make potato pancakes. I find that cooking the rösti in Earth Balance dairy- and soy-free margarine provides enough salt, but feel free to sprinkle on a little extra before serving, if desired. 1. Place potatoes in a large pot and cover with water. Generously salt the water, place the pot on the stove, and turn heat to high. Bring the water to boil and boil the potatoes, uncovered, for 10–15 minutes or until they are soft but not completely cooked through. 2. Drain the potatoes, place them in a large covered container or bowl, and refrigerate overnight. 3. The next day, grate the potatoes and set them aside. 4. Add 2 tablespoons margarine to a 10-inch paella pan or cast-iron skillet, place on the stove, turn the burner to medium-high, and let margarine melt completely. When the margarine begins to bubble, add the grated potatoes. Using a spatula, press the potatoes down, forming a cake. Reduce heat to medium and let the potatoes cook, uncovered and undisturbed, for 15 minutes. Turn the heat back up to medium-high and cook for another 5 minutes. Run a knife or the spatula around the edges to loosen the potatoes. Place a platter on top of the pan, invert the rösti, and let it slide out onto the platter. 5. Add the remaining margarine to the pan. Heat it over medium-high until it bubbles. Swirl the pan to coat the sides with the margarine. Carefully slide the uncooked side of the rösti back into the pan. Cook for another 10 minutes on medium-high heat. 6. Run a knife around the edges again, place a platter on top of the pan, and turn out the rösti. Garnish with thyme sprigs and serve immediately. 7. This dish is best served right away but can be refrigerated in an airtight container for up to three days.